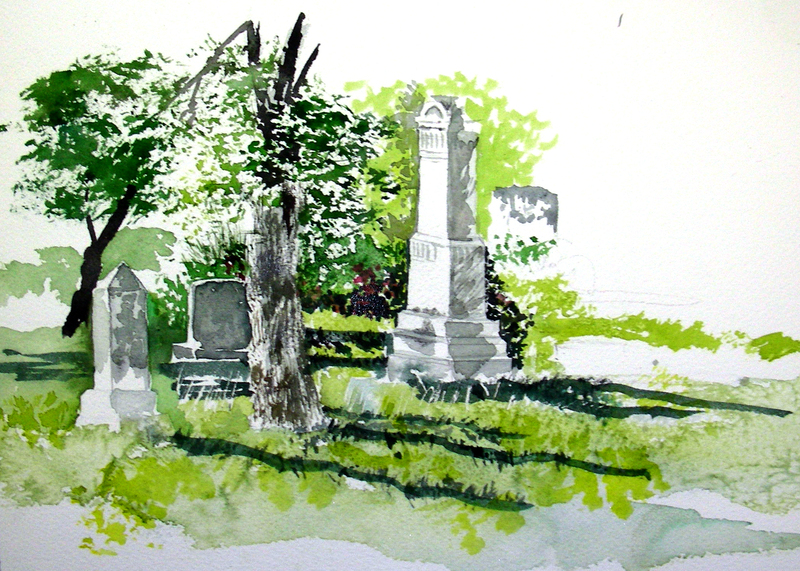 I escaped to the country yesterday (Wednesday) to attempt some plein air watercolor activity. This is the cemetery behind the Cahill Methodist Church, south of Burleson, Texas along F. M. 917. For anyone who looks at my website (www.recollections54.com) there is a painting titled First Night in Waterford of this Cahill Church. It has since been published as the cover of a fiction novel How Shall These Things Be. 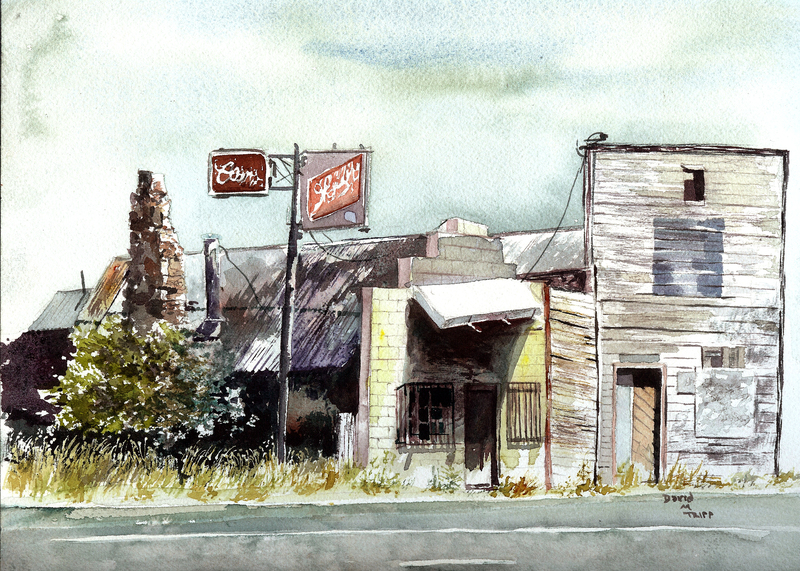 My earlier blogs also have watercolor sketches of the church (one that got accidentally doused with my coffee!). But this is my first attempt to paint a cemetery. What attracted me was the central tree catching the waning late-afternooon light. I’ve recently had a real compulsion to render tree bark in pencil and watercolor, and that was my original intention. I began with the tree. But the stones standing in bold relief to the sun-drenched grass also caught my attention, as did the dark cool flowing shadows. I’m still working on this, not sure how it is going to turn out. I almost have a notion to lay it aside for awhile and go after another tree trunk. Tomorrow begins the first of four consecutive weekends of art festivals. It’s going to be a very busy October, but I’m in the plein air mood, the Texas climate is cooling (63 degrees this morning) and soon the colors will turn. I really want to capture October in Texas, so I’ll try my very best to do some plein air throughout this month despite my high school/college teaching schedule and the art festivals on weekends. We’ll see what transpires . . . This small watercolor I worked on during my second day of the Jazz by the Boulevard festival in Fort Worth. The humidity index was off the charts, and I couldn’t keep my sweat off the paper! I was pleased with much of this composition, and actually signed it. But now I’ve changed my mind and will go back into it. 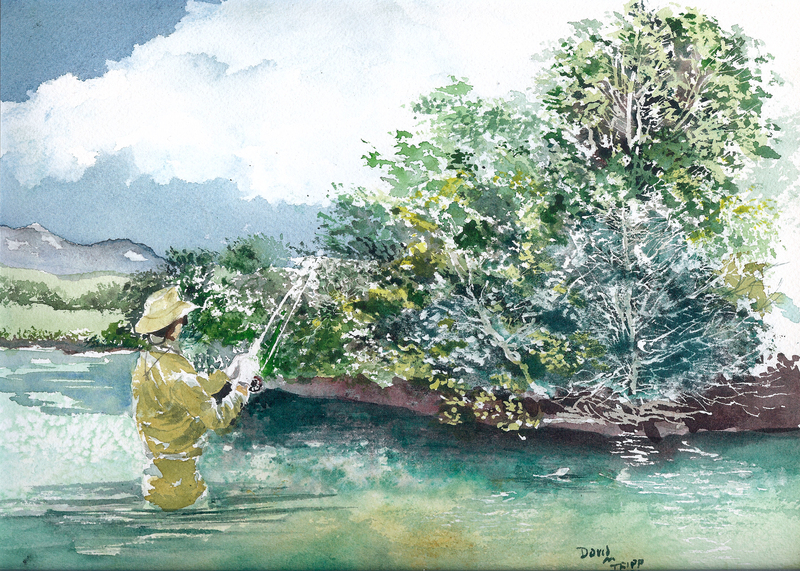 I believe the water surface needs more attention, and I’ve never been pleased with the color and value of the fly fisherman. I’m thinking about sanding out portions of him and trying for a lighter re-do. I don’t like how he disappears into the picture, and don’t want to darken him further. Perhaps a more khaki color is needed in the clothing. I’m very pleased with the cloud burst (that was an accident). But I’m dissatisfied with the pair of pastures on the left side of the composition. I think I’ll leave the foliage as it is. This was a quick watercolor sketch, and I think it still has some possibilities. It’s been along time since I’ve posted. I have managed to do some painting, but mostly I’ve been teaching on two campuses and participating in art festivals. The one posted above was done during the Jazz by the Boulevard festival in Fort Worth the weekend of September 11. The sales were a little slow, and the crowd thin at times (and the heat and humidity absolutely despicable!). So I worked on this throughout the Saturday portion of the event, and finished it early Sunday morning just after the gates re-opened for day two of the festival. For anyone looking at my website (www.recollections54.com), you will notice that I’ve tried this composition before, only the website version has railroad tracks cutting off the bottom of the composition. That was due to cold feet–I couldn’t make up my mind how to lay in the foreground highway. The website version sold, and I decided I would give this composition another shot, only this time put in the highway as it appears in the photograph I took several years ago while cruising about in New Mexico. I think this one is much improved. Thanks for reading. I’ll try to post more frequently, as I have other works now in progress. However, I do have four festivals approaching over the next four consecutive weekends. The year 2010 has been amazing for me. 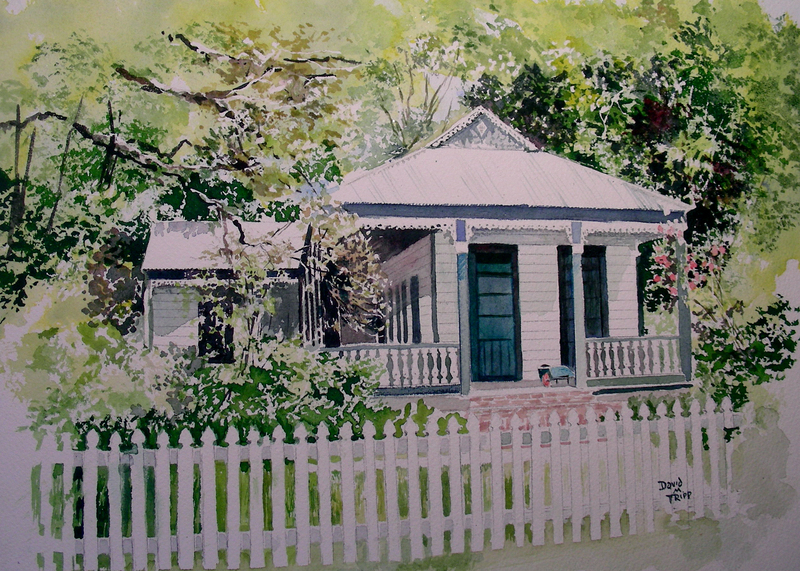 To date I have completed 72 watercolors during this calendar year–many of them en plein air. This weekend will be my first art festival to kick off the fall season. 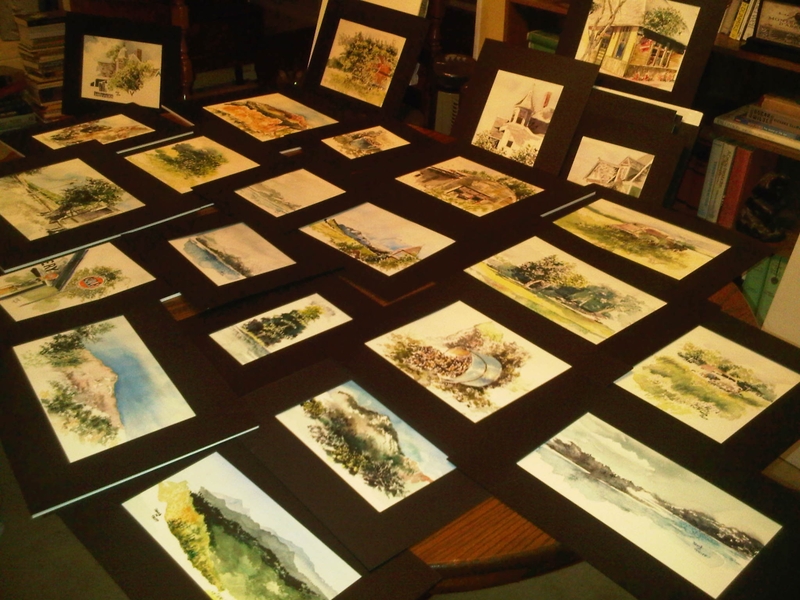 So far, I have matted 25 new original watercolors, and have them spread out here on my dining room table, and in adjacent chairs. I’m beginning to feel the exhaustion of long hours packaging and labeling, but certainly look forward to the festival. It has appeared to be a long dry spell, to anyone following my blog. Actually, the opposite is the case. I have completed two commissions in one week, this one posted just finished about five minutes ago. The reason for the long hiatus since my last post has much to do with school beginning (high school and college the same day), daily chases to complete lesson plans and lectures, and sadly, a funeral that I conducted today for a lovely man that I miss so sorely right now. It’s rare to find “Renaissance” personalities such as this man was (he was an aviator, musician, avid reader, thinker, dancer and all-around socially conscious human being). The funeral home was packed beyond capacity, and all of us found it difficult saying our good-byes. On another note, tonight I began my first live-drawing session in nearly twenty years. There will be twelve more during this month, and I plan to miss none of them. My figure drawing is absolutely dreadful, and I thought this kind of immersion should be able to help considerably. We’ll see. This posted watercolor I managed to complete in about three days, in the midst of school, funeral and live-drawing interruptions. I’m surprised it came together so fast. Probably tomorrow’s deadline has plenty to do with that as well. Perhaps tomorrow I’ll get the other commission posted. I finished one Sunday and delivered it that day. But for now, it’s late, I’m very short on sleep (for over a week now), and I plan to do something about it. Thanks as always, for reading. I do appreciate the posted comments. I read them and re-read them, and they give me direction on my future projects.